a. Amanda Morozumi, CASA El Dorado. No updates. b. Julie Kypta, CASA El Dorado. c. Kim Stadtlander, El Dorado County of Education. Melissa Pereira is no longer with the organization. Kim, Kristin, and Liz will take turns coming to Tahoe for the Lake Tahoe Collaborative meetings and providing service to the South Lake Tahoe area. For referrals for “Ages and Stages”, phone Kim at: 530-295-2455.
d. Bill Campbell, El Dorado County Health and Human Services. He resigns 2/1. Sheryce Allendorf was the Social Services Supervisor in Tahoe; she’s taken a position in Placerville. Colleen Studinarz replaces Sheryce. Colleen is hoping to make the meeting today and it’s her fourth or fifth week on the job. e. Josefina Solano, Public Health. See flyers for Flu Clinics. Jan 16, 18, 23 1:30-4pm. f. Leanne Wagoner, Barton Health. They’ll have updates to Service Guide—coming soon. 2013 Wellness Lecture Series calendar is coming soon. The first wellness lecture is on February 6th, a Cardiologist will present on High Altitude Heart Adaptations. g. Diana Lozano, SLT Branch Library. Storytime programs started again. Mother Goose on the Loose has also begun again and is for youth ages 0-2 years. The library applied for a grant for tablets or iPads. The plan is to purchase ~14, load them with books and apps and you can check it out like a book. h. Roberta Mason, LTCC. Tuition looks like it won’t go up. A fire sprinkler broke and flooded the fitness center so it’s closed for a while. She encourages anyone to take your college classes soon, as there are potential changes coming soon from the State which could increase tuition significantly. i. Pat Okazca, Barton Health, Barton University. Patient numbers have dropped. We have one doctor taking care of deliveries. Families want to know their delivery doctor is someone they can have a long-term relationship with. j. Steve Haggan, El Dorado County Probation. They are hiring for a supervisor and two staff people. k. Karen Houser, Boys and Girls Club. (submitted update remotely, not in attendance) Kids Rodeo, will take place January 15, 16, 17. A flyer will be forthcoming. The focus is on elementary youth. The cost is $3 Friday, $5 Saturday & $5 Sunday. 1. She is collaborating with Boys & Girls Club and has added a K-1class at Bijou and a K-1 class at Al Tahoe site. She will move on to higher grades afterward. She is also collaborating to add more family education, such as kids and parent’s events/ workshops. She would like to see more parent/child events so she and Karen will be brainstorming around this concept. 2. She has started a volunteer program with Advancement Via Individual Determination at South Tahoe High School. She currently has 4 volunteers helping with curriculum kits that go to the Family Resource Center; they AVID students expressed interest in teaching so they will help with the youth classes. They will read books to our kids, lead activities, and also learn about their own nutritional needs. 3. Family Resource Center will continue nutrition education in their Parabajitos youth group (serving Bijou students K-5) and two adult classes going on Mondays and Fridays ( they are 3 weeks away from graduating). 5. She just started visiting South Tahoe Middle School’s Home Economics class on Fridays. She will work on setting nutritional/physical activity goals for them as well as practicing healthy cooking. 6. She will be doing more recruiting after this week and will continue nutrition education for adults. m. Alissa Nourse, Tahoe Youth and Family Services. They are hiring staff for the Incline Village site and will be bringing on an intern. They have had several building leaks, too. They had a great Christmas. Teen wish list gifts got taken care of at the last minute and that made the teens happy. El Dorado Community Foundation is helping with Homeless Activities. They can see people up to age 24 in their facility and have laundry facilities, showers, and food. They get a lot of homeless people travelling through the area. They ask that they participate in some of their services. People can come to the drop in center for as many days (months) as needed, no questions asked, however, they cannot come under the influence. The Drug Free Community Coalition meets after this meeting. They are looking for the Request For Application, which should come out at the end of February or early March. They’ve begun to write the action plan for year one. n. Frank Blakeney, Live Violence Free. His update is part of the Special Update presentation, see below. o. Arturo Rangel, Lake Tahoe Community College, Cal Works Program. In the next two quarters they have money to assist students find employment. This program focuses on job skills. If your organization has an entry level position and there’s a need for someone, they can pay 75% of the wage. This helps your organization and the students. p. Megan Ciampa, Foster Family and Adoption Services. They are looking for foster families. They currently have one family in Truckee and some in South Lake Tahoe. They’d love to service in Alpine County. Pre certification training will be held in April. Next month she’ll bring updated materials. q. Delicia Spees, Family Resource Center. They had an amazing Christmas. People in the community were very giving. Arturo Rangel works as a therapist at FRC for 15 hours per week. Arturo is starting a Men’s Group in English and Spanish. See the flyer. They’ve had a lot of men coming to the women’s support group, ~9 men in the Spanish group. They have collaborated with Probation for referrals to the Men’s Group. They’ve received funds from El Dorado Community Foundation to increase home visitation. They are working with Cal Works. r. Francie Alling, St Joseph’s Community Land Trust. Their 10th Anniversary was in the middle of November. It was a spaghetti feed and was well attended. In February they are doing financial education training in collaboration with Wells Fargo Bank and it will be held at the Lake Tahoe Community College. The flyer is coming soon. s. Kristin Hunt Naefke, Tahoe Turning Point. As of January 9th, we are certified as a group home and outpatient facility. Kiwanis Community Faire is coming up, see the upcoming flyer. They have family reunification and family preservation services available. They are able to provide services to Child Protective Services families. t. Kristi Boosman, TRPA. 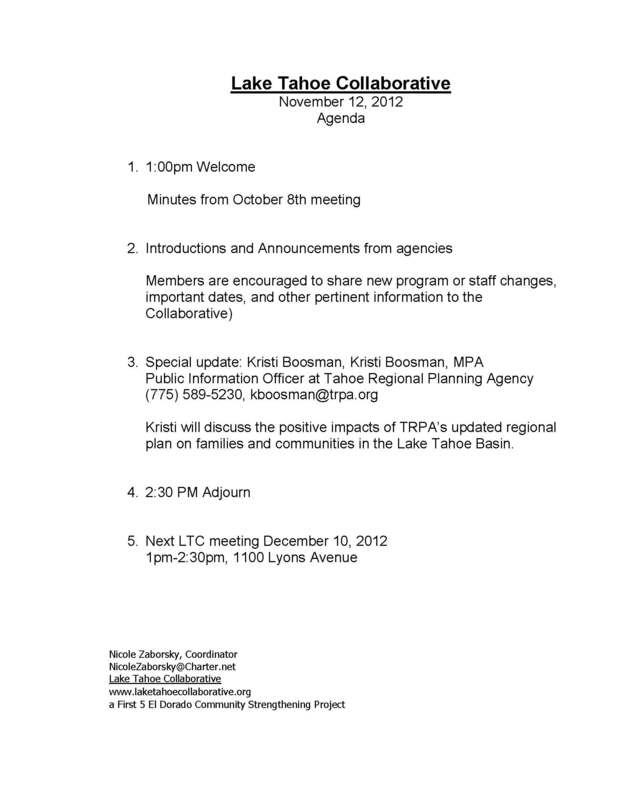 The Regional Plan Update passed on 12/12/12. They recently published “Tahoe In Depth”, a free publication with information on free facilities and updates on projects and water quality. The paper was mailed to all Tahoe mailing addresses. They hope to publish the next paper in Summer, ~June. They are looking for publishing funding. u. Tina Barna, Choices for Children. This time of year, they dread budget talks. It looks like Child Care will still be preserved in the budget. Emergency Diapers and Formula needs continue to increase. Instead of toys for families, they gave diapers and formula at the holidays. The families were excited to receive these gifts. Question to the group: Are we going to do Day of the Young Child again? If so, we need every agency and organization’s support and the maximum financial support that the community can garner. The event will take place in June. She will proceed with scheduling the date and planning the event. At the next CapC meeting, Alissa and Frank will advocate for event support funding. Approximately 250-300 children attended last year’s event. Last year, food was donated by Kiwanis, the bounce house was provided by the Boys and Girls Club, the US Forest Service attended, as did the Department Of Transportation. v. Janet Stevens, El Dorado County Mental Health. The MHSA Housing Public Hearing was on January 3rd. The housing presentation was made for both sides of the hill. A new low income housing development is planned for the corner of Pioneer and Ski Run Boulevard. They want six units designated for those with serious mental illness (Access 1 diagnosis) and who are homeless or at risk of being homeless. They have spent money on a similar project in Shingle Springs and want to do one here, too. It is looking like they will get project approval. Part of the money will be to develop the facility and the other part is to help them pay rent for 20 years. Housing is not linked to people who receive services. There’s a critical need for housing for this population in the community. The downside of the project is that it’s not transitional housing, it’s long term. The target population is people 18-59 years of age; however, if applicants are outside of this age bracket, it doesn’t mean you’re ineligible. w. Peggy Wright, Barton. They have had a total changeover of doctors, so as a result, patient visitation is down. Dr. Matthew Berulich III, M.D., Dr. Sundwall and Dr. Spielvogel (will be on staff next week) have been contracted to provide Gynecology and Obstetrics services. Deliveries are down some while in transition. In terms of Best Beginnings, if people are going to the Valley to give birth, how will they get the Best Beginnings home visits? We’d have to be told about the birth so we know to visit them. We give services to victims of domestic violence and abuse. We give other services, too. We changed our name to be more inclusive of all the services we provide. Parent to Parent Grant, see flyer. It’s their 5th year of this program. It is a Department Of Justice Grant. They had a gap when they didn’t get the DOJ grant, but they supplemented with other grants. They got the DOJ grant again this year. There was no gap in services in five years, but they were looked at as a new applicant so they got funding for 3 years from DOJ. It’s a grant for supervised visits or supervised exchanges. They are not the only agency that provides this service, but because they have received past grants, they have video cameras and walkie talkies and staff has gone to workshops for skills and training. There is always multiple staff on hand when doing the exchange or visit. We currently do supervised visits and exchanges Thursdays-Sunday, but hoping to expand to more days of the week. The exchanges and visits are done during non-office hours, as most parents come after work or after school so it’s convenient for families. Mario Guerrero is the supervisor for this program. Can LVF do exchanges for foster care youth? No. It’s this grant is to protect the custodial parent from non-custodial parent. There’s a sliding fee scale, but they don’t let that limit someone’s ability to participate. Most participants are court ordered to participate in this program. How the visit works: the visit is at 3:30, the non-custodial parent shows up at 3:15 and is patted down, taken to room with no windows (with a video camera monitoring the non-custodial parent and staff person monitoring, too). The custodial parent drops off the kids, the kids and non-custodial parent visit for 2 hours in a room, the custodial parent comes to pick up the children at 5:30, 15 minutes later the non-custodial parent is allowed to leave the room. January is National Stalking month. These clients are in a potential or former domestic violence relationship, so this gives them security in a controlled, monitored setting. Other They have a home visiting program for domestic or sexual violence victims. The grant is in collaboration with Tahoe Turning Point. It involves several different components. The services are in English or Spanish. This program is evidence based. Parenting Without Violence: is a bilingual parenting therapy group. The first meeting is on Tuesday February 5th at 12:30pm. It is a 12 week program. They are conducting this group through the home visiting grant. New Program: Father Engagement. LVF has the goal to engage more fathers. Frank went to a workshop in Sacramento on this subject (https://www.familyresourcecenters.net/events). El Dorado County wants to support this effort in both Placerville and South Lake Tahoe. LVF wants to have one or two engagement events for fathers by the end of the fiscal year. They are upping the awareness for this effort. El Dorado County has a Supporting Fathers Initiative, a 16 week training program. El Dorado County wants to pay for 4 staff people in the South Lake Tahoe area to be trained to teach this program. There’d be two teams, with one male and one female member on each team. A minimum requirement is that one person on each team is a minimum of an intern Licensed Professional Therapist. The program was created by set of professors at Berkeley and a set of professors at Yale. The training will most likely come in next year’s budget. It is primarily for underemployed or unemployed individuals with a focus on parenting skills. It’s a national evidence based curriculum. There will be a one day staff training. The program has huge potential for the community. Comment from Josefina Solano. With regard to an article she read on the Native American population in New Mexico, there is a stigma attached to the word “support” (ex: Parent Support Group). This population of parents prefers to call the meetings “Talking Circles”. Frank agrees with Josefina on the wording of the fathers group and the word “support” should not be used. a. Frank Blakeney, LVF. They have done Adopt-a-Family for 25-30 families for the holidays. They had more donors than families this year. They’ve received a couple grants, one from the Federal Government DOJ and one from El Dorado Co. The home visiting grant starts in January. The DOJ grant is for supervised visits for the Parent-to-Parent program. b. Alissa Nourse, TYFS. The drop in facility is for anyone up to age 25. It now has a shower and laundry. Their Open House is this Wednesday 4:30-6:30pm. They always need donations for the drop in center, such as: soap, towels, underwear, socks, and winter clothes. The Ski Duck program takes local kids to go skiing/riding and they need outdoor clothes for youth ages 6-teenage. They started the PIP program at three elementary schools (FRC is doing Bijou Elementary School). The Drug Free Coalition meets after this meeting today… The Child Abuse Prevention Council is always looking for more representatives, contact Alissa or Frank Blakeney. Meetings are every other month at 9am on Friday. January is the next meeting. c. Megan Ciampa, Foster Family and Adoption Services. They have a push to recruit more adoptive and foster families. She passed around a handout. They’ll host a training for new families in April. To plan for this recruitment, agencies are meeting Tuesday January 8th at 2pm at Foster Family and Adoption Services office. This recruitment effort is meeting once a month through April. Contact her if you’d like to join the planning effort. In the short term, they are looking to expand to Alpine County and other areas they can serve. d. Danielle Rees, Girls on the Run, Sierras. She handed out brochures. There’s a program for girls 3-5th grade and a middle school program for 10 weeks after school. They have volunteer coaches. This program is evidence based. It increases girls’ physical exercise, self-esteem and increases their positive body image. They will host an information session after the holidays for volunteers. e. Karen Houser, Boys and Girls Club Lake Tahoe. They are facing funding challenges. They have had to do staffing reductions. This year, they are focusing on after school and summer programs and they are closed over the school Christmas break. The Holiday Angel program is underway. They have 37 donors purchasing items for kids. After the holiday break, they’ll be open January 7th. f. Tina Barna, Choices For Children. She can tell you what child care providers will be open for the holidays, off hours and weekends for both infant care and school aged populations. They have had some donations for emergency diaper and formula. Coats for Kids allowed them to provide for their families. They’ve been enrolling a small number of new families. g. Leanne Wagoner, Barton Health. The Foundation says “THANKS” for making Festival of Lights and Trees such as success. The 2013 Health and Wellness Calendars are available for everyone and the Community Benefit Report is included in the package, too. 2013 is Barton’s 50th Anniversary, so you’ll be hearing a lot about their history and celebrations. h. Elizabeth Ferry-Perata, Together We Grow. The early care and education program continues to work with the CARES program and with parents. Kristen Torres of Best Beginnings will be at Tahoe Tot Spot to present “Why Won’t My Kid Listen?” on 12/11from 10-11am. Melissa is still out on medical leave. Contact them if you’d like them to host a presentation at your location. They’re looking for ways to reach Tahoe families while Melissa is out on leave. i. Kathy Martinez, UCCE Nutrition Program. They’ve had three adult classes graduate. These graduates committed to an eight week program. They hosted an award ceremony. Three Family Resource Center youth classes graduated and they will host a program extension due to its success and popularity. They have added two classes at Boys and Girls Club. If you have families that would like to have a program, Kathy can do home classes with groups of three or more. UCCE has developed brochures which should be ready for distribution next month. They have posters going up in all the schools. They are trying to get into Tahoe Valley Physical Education classes beginning in January. j. Diana Lozano, South Lake Tahoe Library. They did a lot of outreach for Measure L in past few months. It didn’t pass. The library has the book budget frozen since Measure L did not pass. They have a very positive outlook and continue looking for grants. Should you see any grants, please contact them. They are finishing up the storytime programs this month, then take a 2 week hiatus, then restart programs in January. The Mother Goose on the Loose program is at 11am and 3 pm on Thursdays. In February, Spanish Mother Goose on the Loose will begin for children 0-2 years. This program will run on a trial basis. Next year, they will have a toddler specific story time. They’ve included an interactive light table, an interactive computer and a kitchen area to encourage young families to the library. k. Angela Swanson, City of South Lake Tahoe. The ambulance services underwent upgrades to its infrastructure. They have updated heart equipment which also upgraded their level of service. They have made upgrades to dispatch too, which has improved patient outcomes, provided better quality care and also increased training for staff. The holiday fire truck is out in the neighborhoods and handing out candy canes. Snowglobe is coming the 29-31st. They are hoping to make it an annual event. This year the City is asking them to do more charitable giving. The Recreation Master Plan will begin in 2013 and focus on increasing organized tourism which will increase the number of local jobs, and keep more families in the community. They are partnering with the college and the school district to improve quality of life here. TOT has skyrocketed up. They are starting to feel a slow turnaround in tourism and spending. Through the use of GPS, the City website shows where the snowplow is and where it’s been. The Tahoe Transportation District bus system is doing free days throughout the year. TTD receives air quality monies to fund free and discounted rider days. On the free days, there has been a 20-30% increase in ridership. The bus services have stabilized and are now running in the black. l. Sally Williams, Probation. She has been at the Juvenile Treatment center for two months now. Mental Health did recruit for her previous position and it closed last week. m. Pat Okacza, Barton Health. The Childbirth and Beyond brochure is hot off the press. The Maternal Child Health Task Force brochure is being designed. The target population is new parents who are going home from the hospital. They are in the brainstorming phase and it will be in a question and answer format. Adult Protective Services and Barton are contacts for elder abuse. She’ll work with a group if they’d like to meet about this, contact her. n. Deirdre Slater, El Dorado County Office of Education. Child Development Program. Nothing to report. o. Lorrie Pond. Nothing to report. p. Adriana Salas-Rodriguez, El Dorado County Public Health. Call them for flu shots. q. Kathi Guerrero, First 5 El Dorado. Dental van update-it’s back up and running through Tooth Travelers. They have had a slow time working through contracts and legal agreements, so thanks for your patience. They are following the dental van published calendar. There is Child Care support for families that accept foster children. They are meeting to brainstorm strategies on how to bring this information to the LTC group. r. Rick Alford, First 5. All kindergarten teachers in the community have filled out evaluations. He will tabulate the information and present it to us soon. s. Misty Dee, Tahoe Turning Point. They are partnering with LVF for supervised visits and home visits. They are providing mental health and drug and alcohol counseling for these families. t. Kristi Boosman, TRPA. The Regional Plan Update is going to the Governing Board for vote on 12/12/12. It supports livable and bikeable communities. It will incorporate environmental redevelopment to spur economic development and beautification. Lake Tahoe needs to have a regional focus on this support structure. Thanks to members of this group for talking to the Governing Board and it was great to hear from you on the impact of this plan on our families. u. Amanda Morozumi, CASA El Dorado. Placerville has had many staff changes, but there have been none in Tahoe. There will be no annual fundraiser in February in South Lake Tahoe. Thanks for your support for the holiday donations. v. Wendy David, Tahoe Magic. Dr. Ortega has upped the age for dental insurance to 16 years old. She accepts DentiCal. The older children have such extreme issues that they may need many dental visits. Dr. Ortega is dedicated to this community and we thank her. They have two Santa outfits so contact Wendy to borrow them. Tahoe Magic gave out $27,000+ to families in 2012. They accept donations; please contact her to make one. Thanks for your support and referring families to Tahoe Magic. In May 2012, Barton Health worked collaboratively with community partners to conduct a community health needs assessment for the South Lake Tahoe region. This presentation provides the results from this assessment, areas of opportunity to improve, and action items in the works–responding to the community’s needs. Barton, as part of Health Care Reform Act, is required to conduct a Community Health Needs Assessment every three years. Barton did local one last May. It’s a 250 page report. Visit: http://SouthLakeTahoe.HealthForecast.net for more information. Barton needs to create an action plan to respond to the needs from the Community Health Findings. The data is primary and secondary. They did a phone survey with 400 local residents in their service area from Glenbrook to Tahoma. It was 146 questions and lasted approximately 25 minutes. Adults 18 and over were interviewed. The secondary data is from public health, death records, and health records. Barton held two community forums, one was clinician based and one was a social services and community leader group. They talked about health concerns and social factors. Once the data was combined, nine areas of opportunity emerged: access to health care services, cancer, dementia/including Alzheimers, housing, immunization/infectious diseases, injury/violence prevention, mental health/mental disorders, substance abuse, tobacco use. They realized that education and prevention need to be incorporated into everything. Then they ranked and prioritize the nine areas of opportunity. The three top issues were: substance abuse, access to healthcare services, mental health. The next issues were: dementia, unintentional injury and violence, immunization and infectious disease. Barton will address these issues as priorities in the next few years. •	Note: Leanne can create data from this 250 page report for non-profit agencies and for grant writers. She can break down the data by socio-economic status, age, and ethnicity. Contact Leanne for more information. Barton’s strategic plan is about 20 pages long. They sit on STDFC, support community prevention programs, identify resources for patients with alcohol and drug dependency (including training all doctors and nurses), enhance internal protocols to reduce the abuse of prescription narcotics (electronic medical records, EPIC). Access to Healthcare Services: They have a high statistically significant population of uninsured/underinsured residents. Another fact is that adults in their service area are less likely to get an annual check-up; however, children are getting more frequent than normal health care check-ups. They are in the process of expanding the Barton Clinic. They are creating the health resources guide for the community. Barton focuses on increasing health outcomes for the community. Looking at services for seniors and they realize this is a service gap. They have an expansive tele-health program. They offer 6 specialties rather than sending local patients travelling to outside the area. Mental health and Mental Disorders: They have a higher risk of suicide versus other areas of California and the United States. Mental Health issues came out as a high priority for them. They have a Mental Health program, and are continuing to expand their tele-health program, connecting partners with funding resources, community education and prevention (ex: help with county suicide prevention and campaigns, do community presentations). The region has a low childhood obesity rate versus the rest of the country. Contact Leanne with any questions.